One of our previous underage members Artjoms Petrovs or “Arty” as we all knew him is still playing hurling and football now with his new club in Cork. 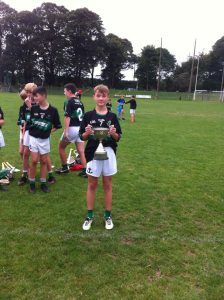 Arty lined out at left-half back for the Nemo Rangers U14 hurlers when they won the U14B final in Cork recently. Congratulations Arty, your skill, dedication and fearless tackling is still remembered by all here in Moorefield.